310 Kent Avenue at South 1st st. 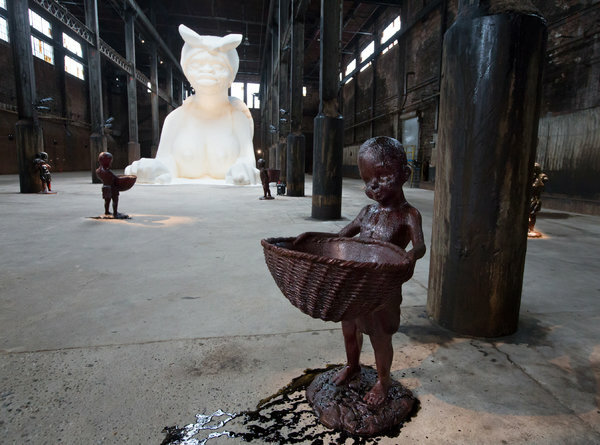 Although Kara Walker’s A Subtlety or the Marvelous Sugar Baby exhibition has been well-attended and widely reviewed, the exhibition has also been fraught with a lack of on-site critical engagement. Some visitors have even responded to the work in ways that are racist, sexist, classist–adding insult to historical and present injuries. On June 22, a mass gathering coordinated by and for people of color will work to reverse this trend (http://goo.gl/NCckqg). Continuing in this spirit, Free University-NYC aims to crowd-source artists, historians, critics, anti-gentrification actors, spoken word performers, and more (from both inside and outside “professional” circles) to host on July 5 an interactive “pop-up” series of dialogues and performances inside the exhibition across the afternoon. As this will be the day after a highly illusory national holiday and a day before the exhibition closes, we aim for these interactions to be reflective, concrete, and forward-moving.